Get ready for the Best French Toast Ever! 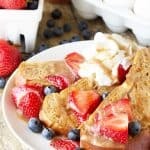 This French Toast is easy to make, totally delicious and it’s freezable too so you can enjoy French Toast even on the busiest of mornings! Can you make French Toast with just egg whites? Yes, you can. Substitute 2 egg whites for every 1 egg called for in the recipe. Do I have to use a griddle to make French Toast? A griddle is a great option for making French Toast because it is completely flat and usually allows for more space to cook your French Toast. However, if you don’t own a griddle, you can use a regular skillet. We recommend using nonstick skillets or well seasoned cast iron. Can I freeze French Toast? Yes you can! 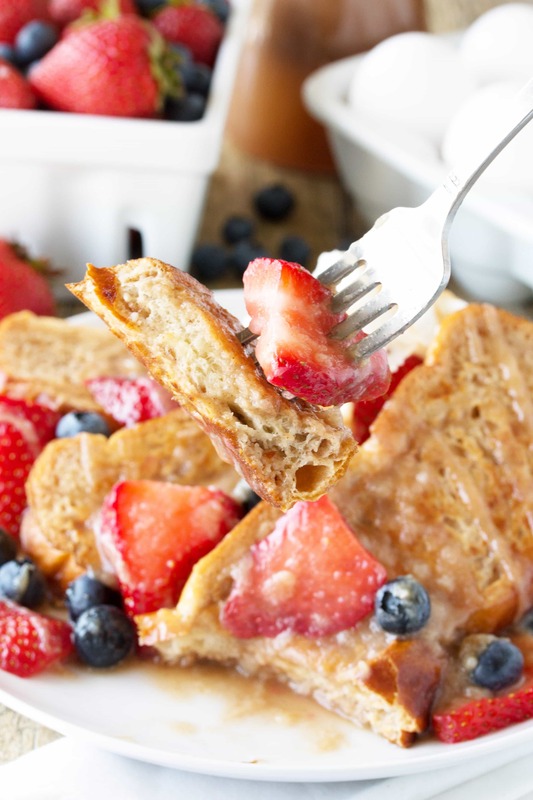 French toast freezes really well and makes for a great, easy breakfast option for busy mornings. To Freeze: cool french toast completely on a wire rack and then transfer the bread to a parchment paper lined baking sheet. French toast can be stacked with a sheet of parchment paper in between each layer. Freeze until solid, then transfer to a resealable plastic freezer bag for long term storage. To Reheat: Microwave on high for about 1 minute per slice until warmed through OR toast in a toaster until heated through for a crispy exterior. What kind of bread should I use to make French Toast? You can use any kind of sliced bread to make French Toast. French bread and other bakery style breads work in addition to sliced sandwich type breads. If you want to kick things up a notch try using thick sliced challah bread or brioche. PRO TIP: The syrup you use with your French Toast can make all the difference. For a French Toast that will absolutely knock your socks off, use our recipe for Liquid Cinnamon Roll Syrup. It’ll blow your mind! Get ready for the Best French Toast Ever! 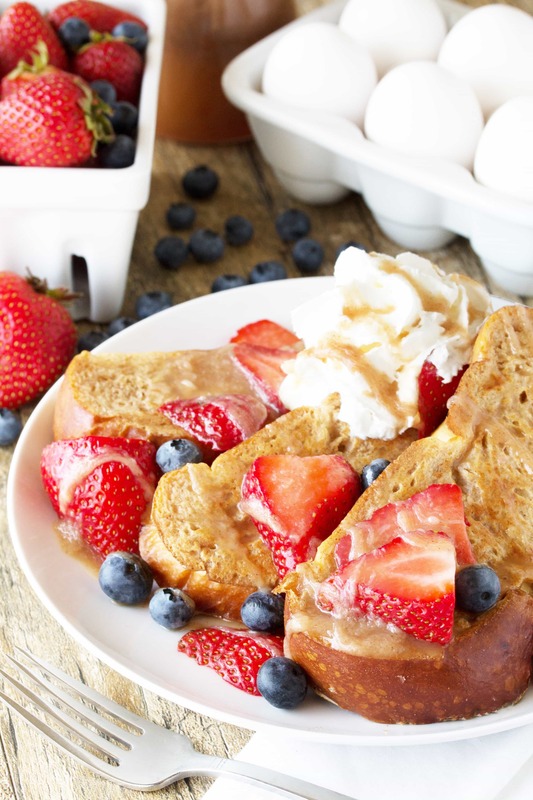 This french toast is made from challah bread and it's freezable too so you can enjoy a gourmet french toast breakfast any day of the week! Whisk milk and eggs together in a large mixing bowl. Add in brown sugar, flour, cinnamon, vanilla, and salt. Whisk until smooth. Soak bread slices in mixture until saturated. Cook bread on each side until golden brown. Serve with berries, whipped cream, and our famous Liquid Cinnamon Roll Syrup. Thank you for this one and for cinnamon syrup as well ! Where can I get the liquid cinnamon roll syrup ? I made it this morning. My hubby loved it and I am sure my children will devour them☺. As for me, I’m not a french toast girl, but I had a piece and I think I …I like this🙄!The syrup is goes really well with it. Thank you for sharing this with us. Yummy! Yummy!